Finally got around to installing Steam platform to a desktop linux machine. Been using Win7 instance here for games before, but as another fan in my laptop died, have been too lazy to reboot into dedicated games-os here. Given that Steam is a closed-source proprietary DRM platform for mass software distribution, it seem to be either an ideal malware spread vector or just a recipie for disaster, so of course not keen on giving it any access in a non-dedicated os. I also feel a bit guilty on giving the thing any extra PR, as it's the worst kind of always-on DRM crap in principle, and already pretty much monopolized PC Gaming market. These days even many game critics push for filtering and essentially abuse of that immense leverage - not a good sign at all. To its credit, of course, Steam is nice and convenient to use, as such things (e.g. google, fb, droids, apple, etc) tend to be. To avoid having Steam and any games anywhere near $HOME, giving it separate UID is a good way to go. AppArmor should allow to further isolate processes from having any access beyond what's absolutely necessary for them to run, warn when these try to do strange things and allow to just restrict these from doing outright stupid things. Given separate UID and cgroup, network access from all Steam apps can be easily controlled via e.g. iptables, to avoid Steam and games scanning and abusing other things in LAN, for example. Creating steam user should be as simple as useradd steam, but then switching to that UID from within a running DE should still allow it to access same X server and start systemd session for it, plus not have any extra env, permissions, dbus access, fd's and such from the main session. By far the easiest way to do that I've found is to just ssh steam@localhost, putting proper pubkey into ~steam/.ssh/authorized_keys first, of course. That should ensure that nothing leaks from DE but whatever ssh passes, and it's rather paranoid security-oriented tool, so can be trusted with that . Steam comes with a bootstrap script (e.g. /usr/bin/steam) to install itself, which also starts the thing when it's installed, so Steam AppArmor profile (github link) is for that. It should allow to both bootstrap and install stuff as well as run it, yet don't allow steam to poke too much into other shared dirs or processes. Running Steam will also start its own dbus session (maybe it's pulse client lib doing that, didn't check), but it doesn't seem to be used for anything, so there seem to be no need to share it with main DE. *) echo >&2 "Usage: $(basename "$0") [ status | kill ]"
Now just steam in the main DE will run the thing in its own $HOME. For further convenience, there's steam status and steam kill to easily monitor or shutdown running Steam session from the terminal. Note the complicated shutdown thing - Steam doesn't react to INT or TERM signals cleanly, passing these to the running games instead, and should be terminated via its own cli option (and the rest can then be killed-off too). With this setup, iptables rules for outgoing connections can use user-slice cgroup match (in 3.14 at least) or -m owner --uid-owner steam matches for socket owner uid. The only non-WAN things Steam connects to here are DNS servers and aforementioned pulseaudio socket on localhost, the rest can be safely firewalled. Finally, running KSP there on Exherbo, I quickly discovered that sound libs and plugins - alsa and pulse - in ubuntu "runtime" steam bootstrap setups don't work well - either there's no sound or game fails to load at all. That should keep all of the know-working Ubuntu libs that steam bootsrap gets away from the rest of the system (where stuff like Mono just isn't needed, and others will cause trouble) while allowing to remove any of them from the runtime to use same thing in the system. 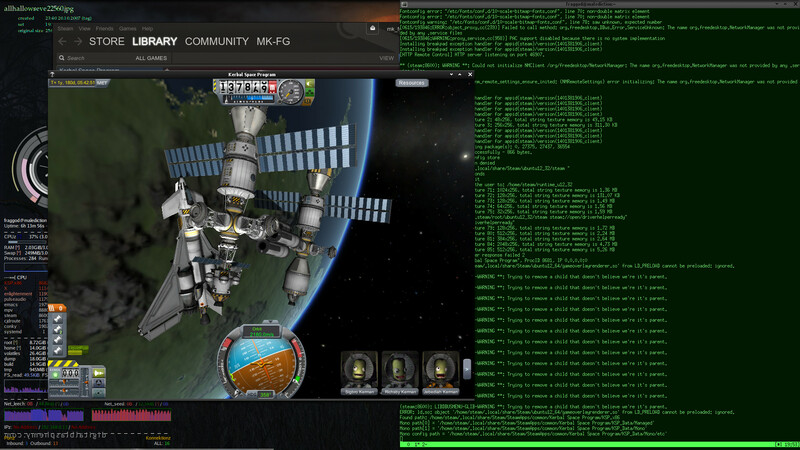 And yay - Kerbal Space Program seem to work here way faster than on Win7.